Hailing from the Turkish capital of Ankara, Hayvanlar Alemi is a group of contemporary players steeped in the art of psychedelics, surf, and expansive rock instrumental grandeur. 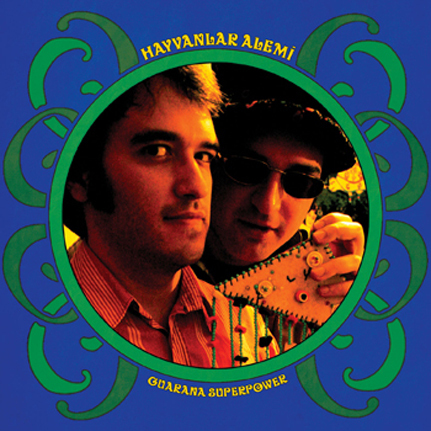 Formed in 1999, the band is led by Ozum Itez (electric guitar) and Isik Sarihan (percussion) and they have released a variety of CDs and mp3 tracks in Turkey and beyond leading up to this, Guarana Superpower, their first ever vinyl LP. The tracks drift from majestic beauty to blazing delirium with Itez etching his manifesto for electric guitar every step of the way backed by Sarihan's wide variety of percussion styles. Although the group is rooted in classical and modern Turkish psych-rock in spirit, they draw on a large range of sounds and influences, and traces of Turkish styles are hard to pin down. Two of the tracks, Mega Lambada and Guarana Superpower, are more reminiscent of late 80s post-punk experimental mind melting, referencing Torch of the Mystics era Sun City Girls in grand fashion. Other cuts expand on a diversity of areas including tripped-out surf, retro Cambodian rock, electrified Thai Mor Lam and Saharan guitar music. To summarize, Hayvanlar Alemi is one of today's great instrumental combos and Guarana Superpower proves it! This limited one-time LP pressing comes in a full color heavy duty tip-on jacket.